Slug is a hotheaded Dinobot brawler who never met a fight he didn't like, or an opponent he didn't think he could defeat. His enemies usually wind up as pools of liquid metal. Liquid metal? As in, "slag"? Well played, Hasbro. Well played. For those not in the know, this character was once upon a time known as "Slag." It's not a problem that they changed his name to keep from insulting British fans, just that it took them so long to find him a new one. A name that was his own, not taken from some other character - and to think, all it took was changing a single vowel! I can't wait to tell this news to Gramlock and Uptimus Prome! Obviously lots of Transformers are updates of G1 toys, but not a lot of them are updates of G1 toys we've actually reviewed! That'll certainly make things easier! The head is a perfect parallel, carrying forth almost every feature of the original. Instead of a red visor, his nose now breaks it into two red eyes, and his chin is rounded, rather than having an angular front, but there's no mistaking him! 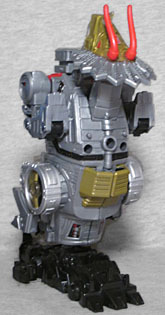 The robot has a large, barrel-shaped chest, with many of the same sculptural elements as before. There's no longer a Diaclone pilot compartment in his torso, which also means that the plate of silver armor there doesn't tuck into a hollow any longer, instead coming forward from the surface a bit. 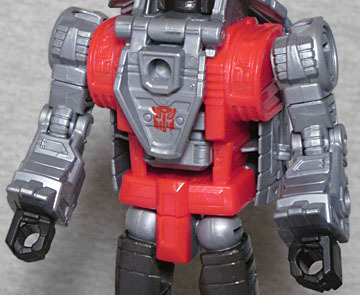 The molded details on his shoulders - horizontal bars passing behind long triangular shapes - represent patterns on the old toy's stickers. I'm personally a bit bummed that he no longer gets the "wings" that unwrap from around his ribs, but on the plus side, there's no more "tail" kibble: that hides away in his feet to help keep him standing. If you remember the old review, Slag had swivel shoulders and nothing else. Slug, by contrast, has hinged knees, swivel thighs, balljointed hips, a swivel waist, hinged elbows, balljointed shoulders, and you can even reach in there and swivel his head around a little if you want to! Way to improve things, Hasbro! 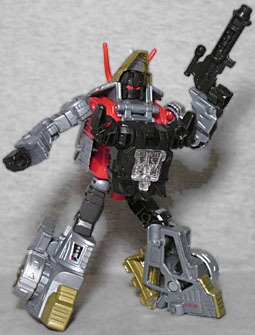 Slug's weapon is a black rifle that looks not at all like the chromed "electron blaster" the character carried in Generation 1, and he also comes with the hand-foot-gun thing introduced for "Power of the Primes," which can be plugged into his chest like a robotic BabyBjorn. Converting Slug is not especially tough: the only substantial difference between this figure and the classic one is the way you have to deal with his tail: like we said above, that folds out of his feet. Otherwise, the lower legs flip over to become the dino's back, the arms become the front legs, and the head disappears into the mouth. 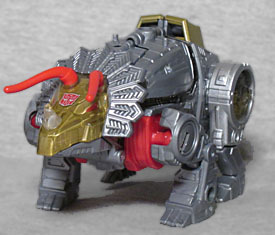 There's one extra step, where you have to pop the dino's head away from the body in order to give him a neck, but you could skip it entirely and still have a complete toy. 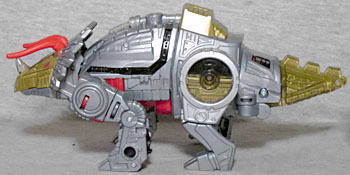 Slug's altmode is the king of all dinosaurs, a triceratops. He's got the big neck frill and the three horns on his face, though the positioning of the joint that allows the chest armor to flip up and become the dino's lower jaw means you lose a feature the original toy had: the ability to pose like his mouth was open. Oh, you can still do it, it just looks anatomically incorrect. His colors remain the traditional Dinobot "silver, gold and red," though none of his pieces are chromed this time (thank goodness). 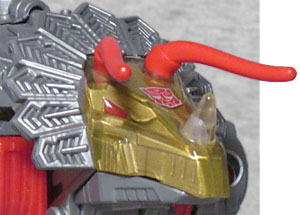 The face and tail are both molded from clear plastic, then painted gold on the inside, to give a "layered" look like the original toy had. It works decently well; not perfect, but not bad. The only stickers used are two small ones right near his tail (or the robot's knees, as the case may be). "Power of the Primes" brings back combiners, including characters who have never been combiners before. All the Dinobots pile into a big guy called Volcanicus, and since there's no historical precedent for them doing this, Slug has the ability to turn into either an arm or a leg. The instructions show him being the left arm, but who's to stop you from making him be the right leg? No one, that's who! 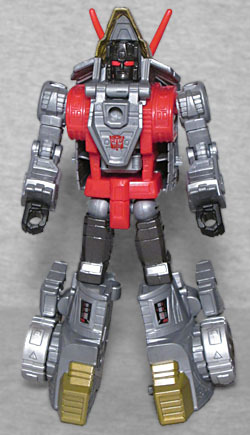 You will need the armor from Grimlock to complete the foot, though. Slug is a good update of an old favorite. I'd still like to get Scoria, the third-party Masterpiece-style knockoff of the character (and if I do, maybe I'll tell you the story of how I may be the only living person who's been injured by a triceratops), but for now, this is a fine modern Transformer.